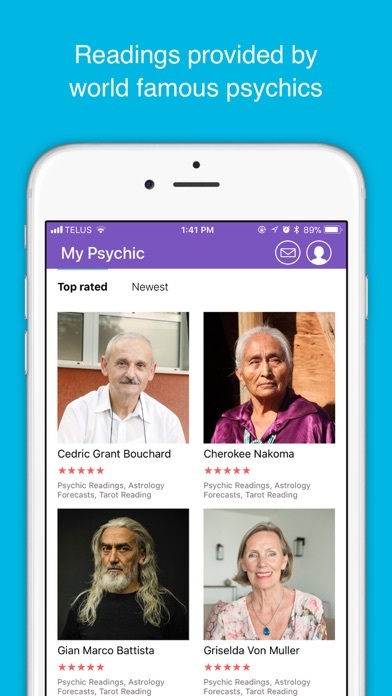 You no longer need to settle for your average newspaper reading horoscopes or neighborhood psychics when you can have access to famous psychics from the palm of your hand with the free MyPsychic app. You can ask our psychics whatever you want, anytime you want. 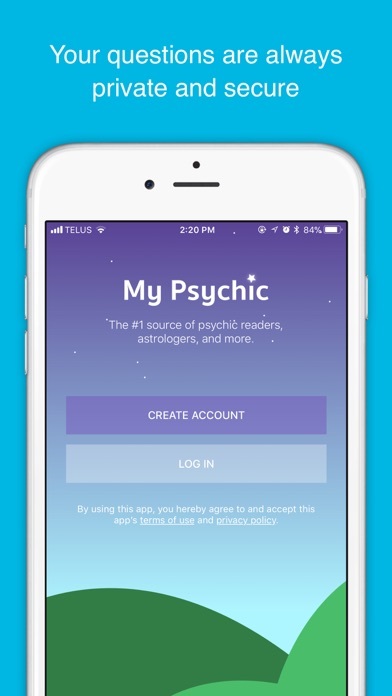 With our App - Immediate access to your personal Psychic on the go, anytime, anywhere - Ease of use - The answer to your burning question is just a few clicks away - Access to Psychics that work with Celebrities and have long waiting lists. 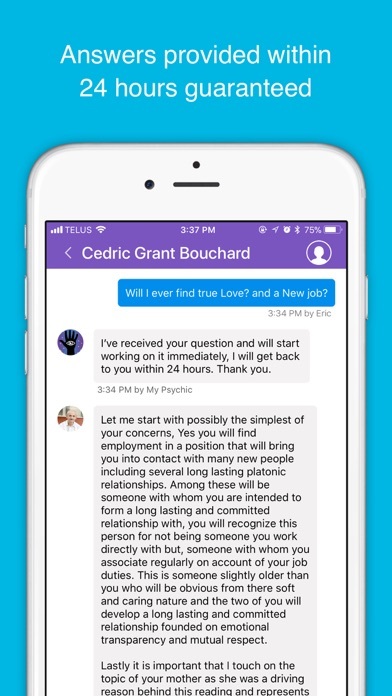 - Quality, professional customer service How does the MyPsychic App Work? 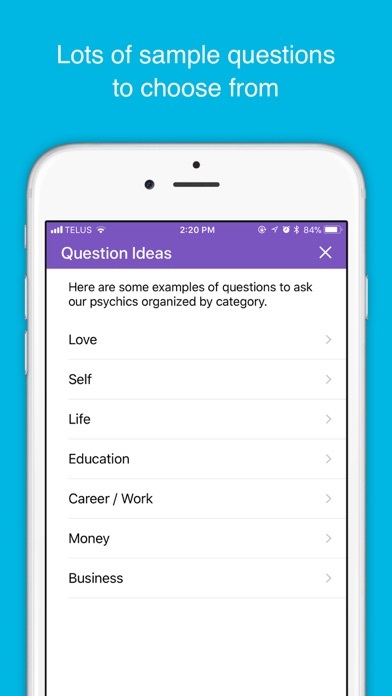 - Create a Free profile with your birth details - Ask a question (first one is free) - Our Psychic will answer your question. What to ask? What is your burning question? Is it about your love life, soulmate, future, relationship issues, financial concerns? We can help you answer them all. I can help you by giving you a psychic reading - When will I meet my soul mate? - Is my partner cheating on me? - Does my ex still think about me? - Am I in the right career? This also believe this is a scam. I decided to download this app even after i read most of the reviews about not getting a free question answered and sure enough it said i have all ready use my free question so do i think this a scam you bet i do. I don’t know about everyone else but I just started using this app maybe about a month ago. I chose the psychic Cedric & he is amazing I’m still waiting to see some of my results. So, first of all, I got a response saying that I’ve already did a free question. Which is false. I’ve never come a cross this app til now. The physic wasted my free question, since they did I won’t be planning on recommending this app nor will I pay for anything. Don’t download this it’s a waste of your time. I've contacted several of the psychics and asked them the same questions. Okay I admit it’s kind of stupid. Anyhoo, I’m a bit skeptical because their answers are almost identical to each other. Hmmm. I understand if it’s written in the stars and all but come on. Just seems a bit hinky. Oh and don’t even think about using Maxwell Williams, that guy is straight fraud. Didn’t answer a question I paid for and then suggested I continue with more payments to find out more. Uh, no thanks. Update: stay away from Pete Minchenko. Dude is a total fraud, gives vague answers so you'll pay again. Total money grubbing jerk. Good app the few times ive used it, how ever I got charged for a reading, but it shows that the question failed to send ... and I emailed the support email and still no answer it’s been two days. Not very happy. I email the support email again if I still don’t hear anything I’m going to call Apple care for a refund on my $10. This will be the last time I use this app. If I could give 0 stars I would!